The body of literature on spirits is vast; this list barely scratches the surface. It covers material particularly useful in the creation of this book and inspirational material for GMs interested in a Spirits campaign. Older public-domain works (like those of Dante and Milton) are also available from "Project Gutenberg" online. Briggs, Katherine. An Encyclopedia of Fairies (Pantheon, 1976). A comprehensive guide to faeries from British and Celtic folklore. Butler, Elizabeth M. Ritual Magic (Pennsylvania State University Press, 1998). 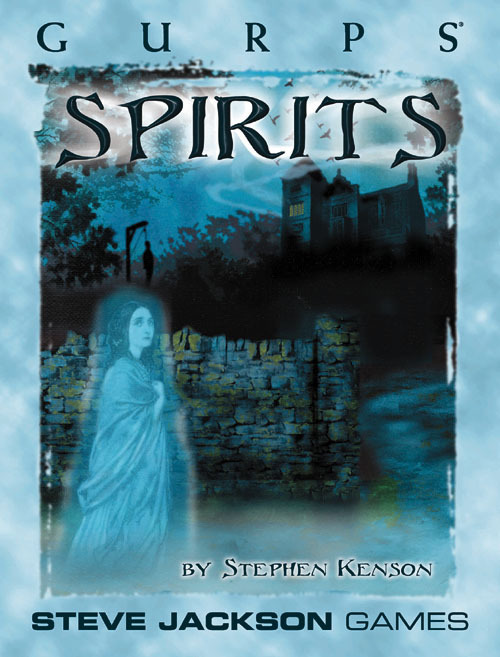 This and the other books in the History of Magic series from the same publisher are recommended for ideas regarding magical rituals and spirits. Davidson, Gustav. A Dictionary of Angels (The Free Press, 1971). A very complete resource about angels and demons from history and mythology. Eliade, Mircea. Shamanism: Archaic Techniques of Ecstasy (Princeton University Press, 1972). Covers many different cultures and their ideas about shamanism. Evans-Wentz, Walter Y. The Fairy-Faith in Celtic Countries (Citadel Press, 1990). Study of the survival of fairy beliefs in the 19th century. Fanger, Claire, ed. Conjuring Spirits: Texts and Traditions of Late Medieval Ritual Magic (Pennsylvania State University Press, 1998). Part of the History of Magic series (see above) focusing on rites of spirit summoning. Ginzburg, Carlo. The Night Battles (Johns Hopkins University Press, 1992). A history of the Benandanti and their role in medieval Europe as seen through the eyes of the Inquisition. Guiley, Rosemary Ellen. The Encyclopedia of Ghosts and Spirits (Facts on File, 1992). Everything you ever wanted to know about ghost and spirit activity and research. Her Encyclopedia of Mystical and Paranormal Experience and Encyclopedia of Witches and Witchcraft are also recommended. Harpur, Patrick. Daimonic Reality: A Field Guide to the Otherworld (Penguin USA, 1996). An in-depth look at the implications of the existence of a spirit world (or worlds) for our view of reality. Hite, Kenneth. Suppressed Transmission and Suppressed Transmission: The Second Broadcast (Steve Jackson Games, 2000). Two volumes of Ken Hite's collected Suppressed Transmission column from Pyramid, full of Illuminated weirdness. Mack, Carol and Dinah Mack. A Field Guide to Demons, Fairies, Fallen Angels and other Subversive Spirits (Henry Holt, 1999). 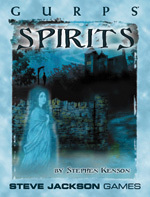 A catalog of various spirits to provide inspiration for modifying the templates in this book. Rose, Carol. Spirits, Fairies, Leprechauns, and Goblins: An Encyclopedia (Norton, 1976). Another comprehensive catalog of spirits (focusing mainly on faeries). Schmitt, Jean-Claude. Ghosts in the Middle Ages: The Living and the Dead in Medieval Society (University of Chicago Press, 1998). In-depth study of medieval beliefs about ghosts, very useful for a Middle Ages Spirits campaign. Shaw, Gregory. Theurgy and the Soul: The Neoplatonism of Iamblichus (University of Pennsylvania Press, 1995). The philosophical history of Hermeticism. Stewart, R.J. Earth-Light (Mercury Publications, 1998) and The Power Within the Land (Mercury Publications, 1998). Information on faeries and Celtic mythology. Van Scott, Miriam. Encyclopedia of Heaven and Encyclopedia of Hell (both St. Martin's Press, 1999). Everything you wanted to know about angels and demons. Alighieri, Dante. The Divine Comedy (available together in a 1994 Penguin USA edition). Classical view of heaven and hell (and their inhabitants). Anderson, Poul. Operation Chaos (Tor Books, 1999) and Operation Luna (Tor, 2000). An alternate Earth where magic works and spirits are fairly commonplace. Anthony, Piers. The Incarnations of Immortality series. This seven-book series, beginning with On a Pale Horse (Ballantine, 1989), describes people who take on the roles of universal concepts like Death, Time, Fate, War, and Nature. Cook, Glen. The Swordbearer (Tor, 1993). Features spirits that take over the bodies of mortals and control them, only to abandon them when the body is slain. They can be killed permanently only by "pursuing" them to the spirit plane and killing them in a battle of wills. Gaiman, Neil and Terry Pratchett. Good Omens (Ace, 1996). Darkly humorous version of the war between heaven and hell. Gibson, William. Count Zero (Ace, 1987). "Spirits" in the Net and using Voodoo to deal with them. Hamilton, Peter F. The Reality Dysfunction, The Neutronium Alchemist, and The Naked God (Warner, 1997-2000). Describes the return of the damned from hell to possess the living of the 26th century. Keyes, Gregory. The Age of Unreason series – Newton's Cannon, A Calculus of Angels, Empire of Unreason, and The Shadows of God (Del Rey, 1999-2002). The second and third books are full of spirits. Kurtz, Katherine and Deborah Turner-Harris. The Adept series – The Adept, Lodge of the Lynx, The Templar Treasure, Dagger Magic, and Death of an Adept (Ace Fantasy, 1991-1996). A lodge of ritual magicians in modern Scotland investigates occult crimes. Lackey, Mercedes. The Diana Tregarde mysteries – Children of the Night, Burning Water, and Jinx High (Tor Books, 1989-1991) – are about a witch and occult investigator and have plenty of spirits and ritual magic in them. Lewis, C.S. The Screwtape Letters (many editions, including a recent one from HarperCollins, 2001). Correspondence between an elder and a younger demon on the finer points of temptation. Milton, John. Paradise Lost (Penguin Classics, 2000). Another classic view of heaven and hell. Powers, Tim. Expiration Date (Tor, 1996), Last Call (Avon, 1996), and nearly any other book by him. Ritual magic, spirits, and occult weirdness. Pratchett, Terry. Hogfather (Harper, 1999), Reaper Man (Acacia Press, 1992), Small Gods (Harper, 1994), and Soul Music (Harper, 1995). Pratchett's Discworld is as spirit-infested as most fantasy settings, but these four books are of special interest. See GURPS Discworld for notes on Discworld gods and spirits, and GURPS Discworld Also for a "small god" character template. Pullman, Philip. The His Dark Materials trilogy – The Golden Compass, The Subtle Knife, and The Amber Spyglass (Del Rey, 1999-2000). A "young adult" fantasy trilogy set in a magical alternate Earth where people's personal daemons (or companion spirits) manifest themselves. Rice, Anne. The Witching Hour (Ballantine, 1990). A novel about a dynasty of witches with paranormal powers and their unusual spirit ally. Her other novels present ideas about spirits, the undead, and the afterlife. Turtledove, Harry. The Case of the Toxic Spell Dump (Baen, 1993). An EPA investigator working in a world of real spells, magic, and spirits. Twain, Mark. Letters from the Earth (HarperPerennial, 1991). Twain offers criticisms and insights on religion in his unique and witty style. Williams, Walter Jon. Aristoi (Tor, 1992). Set in the far future, with a technological "spirit world" created by virtual reality and personality engineering to create daimones similar to those from Greek myth. Celtic Myth, by Ken and Jo Walton. Information on faeries and the Sidhe. Creatures of the Night, by Scott Paul Maykrantz. A number of unique takes on spirit and horror creatures. Horror, by J.M. Caparula, Scott Haring, and Ken Hite. Information on how to run horror campaigns that combines well with the spirit rules and information in this book. In Nomine. A complete setting for angels and demons (along with pagan nature spirits and gods) based on the war between heaven and hell. Psionics, by David Pulver. Deals with psychic powers and spirits as psychic entities. Religion, by Janet Naylor and Caroline Julian. Detailed information on creating a mythos using deities, symbolism, shamanism, and many other things related to spirits. Undead, by Sean M. Punch. Detailed information on undead spirits like ghosts and the idea of playing undead characters. Voodoo: The Shadow War, by C.J. Carella. A modern-day setting with spirits and ritual magic where rival groups of initiates and spirits fight a secret war for the fate of the world. Barnes, Emery et al. Axis Mundi: The Book of Spirits (White Wolf Games Studio, 1998). A comprehensive spirits sourcebook for the Werewolf: The Apocalypse RPG. Brucato, Phil et al. Beyond the Barriers: The Book of Worlds (White Wolf Games Studio, 1996). Numerous spirit worlds and their inhabitants for the Mage: The Ascension RPG. Hartshorn, Jennifer et al. Wraith: The Oblivion (White Wolf Games Studio, 1994). Perhaps the definitive RPG for playing ghosts. Kenson, Stephen. Magic in the Shadows (FASA Corporation, 1999). Detailed information on magic, spirits, and spirit worlds for the Shadowrun RPG. Pearcy, Derek. In Nomine (Steve Jackson Games, 1997). Angels vs. demons in the war between heaven and hell. The GURPS In Nomine version may be of particular interest to GURPS players. Stoltz, Greg and Tynes, John. Unknown Armies, Second Edition (Atlas Games, 2002). Modern occult horror and conspiracy, including some unique views of magic and spirits. Delano, Jamie et al. Hellblazer (DC Comics). The protagonist John Constantine encounters many different kind of spirits in his exploration of the occult. Ellis, Warren. Hellstorm (Marvel Comics). Features some interesting views of heaven and hell, including a reverse exorcism performed by the son of Satan to force an angel out of a person's body. Gaiman, Neil. Books of Magic (DC Comics). A tour through the magical worlds of the DC Universe, with a wide range of spirits and magic. Gaiman, Neil. Sandman (DC Comics/Vertigo). An excellent resource for ideas about the dream world and other spirit worlds. A spin-off series called The Dreaming also has some excellent material. Laban, Terry and Steve Parkhouse. Muktuk Wolfsbreath: Hard-Boiled Shaman (DC Comics/Vertigo). Hard-boiled detective fiction except the protagonist is a Siberian shaman dealing with ghosts and demons. Moore, Alan. Promethea (America's Best Comics). A college student becomes the embodiment of a fictional goddess from Immateria, the realm stories and spirits come from. Morrison, Grant. The Invisibles (DC Comics/Vertigo). Conspiracy theories and high weirdness meet up with shamanism and ancient magic. Ostrander, John. The Spectre (DC Comics). The adventures of a heavenly Spirit of Vengeance bonded with the soul of a dead police detective. An animated Spectre short is included as an extra on the Blu-ray and two-DVD versions of DC's Justice League: Crisis on Two Earths. Angel Heart (Alan Parker, 1987). Spirits and Voodoo. Can't say much more than that without giving away the ending. Beetlejuice (Tim Burton, 1988). Inept ghosts seek help in "exorcising" the new people living in their house. Casper (Brad Silberling, 1995). A modern version of the cute cartoon ghost. Good inspiration for light-hearted spirit games. Dogma (Kevin Smith, 1999). Two fallen angels are trying to get back into heaven, even though it will trigger the Apocalypse. Dreamscape (Joseph Ruben, 1984). A psychic has the power to enter people's dreams. Good inspiration for the dream world, particularly for a psychic powers campaign. Fallen (Gregory Hoblit, 1998). A policeman searches for a demon who can possess any body. Faraway, So Close (Wim Wenders, 1993). The sequel to Wings of Desire, see below (and considered not quite as good). An angel becomes a mortal and seeks the aid of his old friend Damiel (who became mortal in the previous film). The Frighteners (Peter Jackson, 1996). Michael J. Fox as an offbeat psychic investigator and ghost-buster aided by a trio of undead spirits. May provide some ideas on mixed mortal/spirit groups. Ghost (Jerry Zucker, 1990). An excellent example of the importance of a medium when dealing with spirits. Ghostbusters (Ivan Reitman, 1984). Ghost-catching scientists vs. evil spirits. Good examples of spirit-affecting technology. Michael (Nora Ephron, 1996). John Travolta as an angel seeking a way back into heaven. Photographing Fairies (Nicholas Willing, 1997, PAL DVD). Based on a true story of two English children who claimed to have photographed fairies in 1917, featuring a cynical photographer who discovers that their pictures are real. The Prophecy (Gregory Widen, 1995). Christopher Walken as the archangel Gabriel, come to Earth to capture the soul of the most evil human and use it to storm the gates of heaven. The two sequels (Prophecy 2 and Prophecy 3: The Ascent) may also be worth watching. The Serpent and the Rainbow (Wes Craven, 1988). Fact-based horror movie about a Harvard researcher who travels to Haiti to uncover the secrets of making zombies. Based on the book by Wade Davis (which is also recommended). The Sixth Sense (M. Night Shyamalan, 1999). A boy who sees dead people. Offers some creepy ideas on how to present undead spirits. Star Wars (George Lucas, 1979). This film and its various sequels have good examples of ascended spirits and psychic powers in science-fantasy. 2001: A Space Odyssey (Stanley Kubrick, 1968). Good example of "spirits" as highly evolved alien entities. What Dreams May Come (Vincent Ward, 1998). A man seeks to be reunited with his wife in the afterlife. Useful inspiration for both the dream world and the afterlife. Wings of Desire (Wim Wenders, 1988). The angel Damiel falls in love with a beautiful trapeze artist in Berlin and chooses to become mortal. Hollywood remade this as City of Angels starring Nicholas Cage and Meg Ryan. Angel and Buffy the Vampire Slayer. One is a vampire private detective and the other is a young woman chosen to slay monsters. Both series involve a fair number of spirit menaces, and some of the characters (like Willow) are ritual magicians. G vs. E. Ghosts are sent back to Earth to fight against demons. Highway to Heaven. An angel (who's actually more of an ascended spirit in terms of this book) and his human sidekick wander America doing good deeds. Neverwhere. British program based on Neil Gaiman's book of the same name, about a hidden magical society. Quantum Leap. The disembodied protagonist travels through time by possessing different host bodies. Star Trek. The original series and its successors include many examples of incorporeal aliens with spirit-like abilities. Good examples for sci-fi spirits. Touched by an Angel. Three angels are dispatched from heaven to inspire people who are at crossroads in their lives. One of the angels is also the Angel of Death. The X-Files. FBI agents investigate the paranormal. Plenty of psychic and spiritual threats.